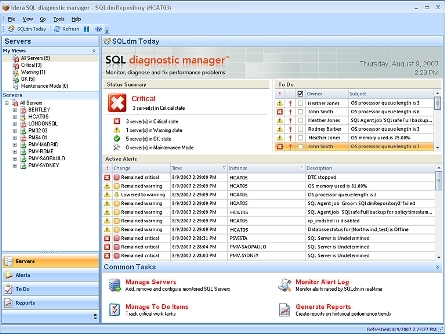 SQL diagnostic manager, version 5.6, is a performance tuning tool that alerts administrators of health and availability issues across all SQL servers. administrators of health, performance and availability issues across all SQL servers. 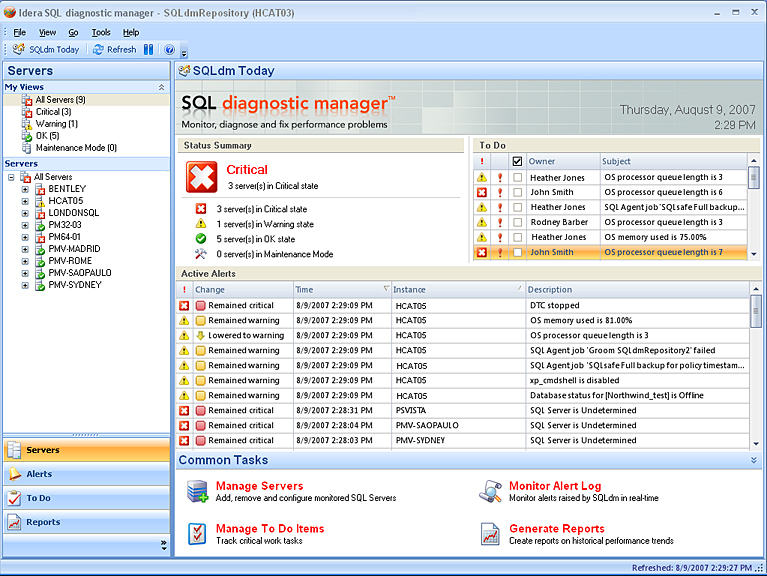 SQL diagnostic manager, version 5.6, proactively alerts administrators of health, performance or availability problems within their SQL Server environment, all from a central console. Idera's diagnostic tool minimizes costly server downtime by providing agent-less, real-time monitoring and customizable alerts for fast diagnosis and remediation of SQL Server performance and availability problems. It also pinpoints common performance issues, such as worst-performing code, and has extensive historical metrics for in-depth trend analysis. SQL diagnostic manager, version 5.6, includes a mobile monitoring capability that allows DBAs to check on the performance of their SQL Servers wherever they are. Mobile monitoring: Incorporates Idera's SQL mobile manager product. Users can view real-time SQL Server performance data, perform management tasks and receive alerts on a Windows Mobile or Blackberry device. Adaptive alerting: Automatically recommends alert threshold settings based on pattern-recognition analysis of historical server performance data. Alert snoozing: Enables DBAs to temporarily silence alerts when running applications that are known and allowed to exceed general thresholds. Application security: Provides configurable server access permissions for users of SQL diagnostic manager. Operations and help desk staff members who lack the ability to change or modify servers can access them. It also allows operations and help desk staff to monitor SQL Server without changing or modifying those servers. System requirements: Management consoles, services and data repositories require 32-bit Windows 2000 Server SP4, Windows XP SP2+, Windows Server 2003 SP2, Windows Server 2008, Windows Vista SP1 64-bit, Windows 2003 SP1 (x64 and Itanium 2), Windows XP Professional x64 or Windows Vista SP1; .Net 2.0 SP1+ and MDAC 2.8 Monitor capable of displaying 16-bit color or greater and a resolution of 1024x768. Repositories: SQL Server 2000 SP4, SQL Server 2005 SP1+, SQL Server 2008 supported; monitored SQL Servers Standard and Enterprise Edition, including 64-bit SQL Server on the operating systems they support. Pricing: $2,049 per SQL Server instance.